Support for 3DS files added (beta). PocketPC version in synch (no 3ds file support). Ported to: Irix, Solaris, BeOS, AIX, HPUX and MacOS. Light attenuation models added (no attenuation, and attenuation in 1/d). Bugs in ring and disc primitives fixed. Bugs in cone and cylibder primitives fixed. Parser enhanced (more checks on data range). New threading mechanism with 2, 4 and 8 threads. Patch (smooth triangle) primitive added. Internal matrix support for later transformation (scale, rotate and translate). Internal priority queue changed to render big scenes(>100000 objects). Multi-theading enhanced on WIN32 platform. Ported to DEC Unix (alpha). Parser enhanced to avoid strict syntax. Plane primitive fixed to accept positive normal with negative distance. JPEG compression level added in parser (jpeg_quality) for platforms where JPEG is supported. Parser enhanced for more flexible syntax. 'declare' directive for colors added to parser. 'include' directive added to parser. JPEG output file format added. Parser changed for more flexible syntax. Ported to the pocketPC platform (Windows CE) for iPAQ. Internal structure changed to include bounding slabs. Refraction added (thanks to Stephane Marty). Multi-threading support added (WIN32 threads and pthreads) with two threads. Support for both threaded and non-threaded version. Ported to Linux glibc2 (RedHat 6.2). BMP and TGA support enhanced. Ouput file format added: PPM. Dynamic display added (slow and WIN32 only). Ouput file format added: TIFF. Depth of field effect added. Order of appearance for surfaces changed to assign the same texture to several objects. Primitives supported: sphere, triangle, plane, polygon, ring. Output file format: BMP (buggy), TGA (buggy), PNG. Input file format: proprietary (primitive) stream-oriented scripting language. 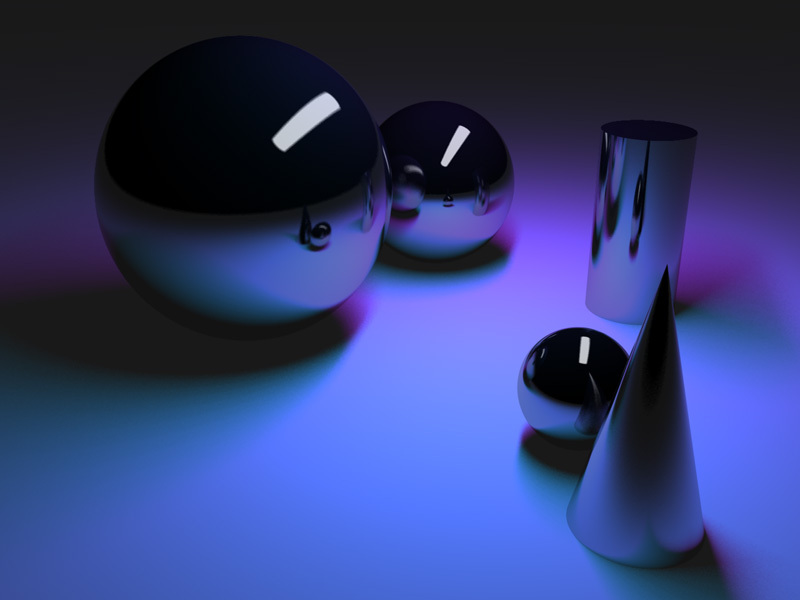 Surface parameters: ambient, diffuse, brilliance, specular, roughness, reflection. Antialiasing: none, supersampling, adaptive. Each with or without jittering. WIN32 only (compiled on Windows NT 4 SP6 Intel and Alpha and Windows 2000 SP1). Camera: location, direction, up, right, at, viewAngleX, viewAngleY, viewAspect.